AMP Visual regularly post recent projects that we’ve designed, by way of showing off our wares so to speak and sometimes we show items from our design archives that are still favourites of ours. Occasionally though, we have items in our achieve, the ‘accidents’, the oddities, the leftovers or the strangely cool that usually don’t see the light of day. These items are usually some of our favourite things. 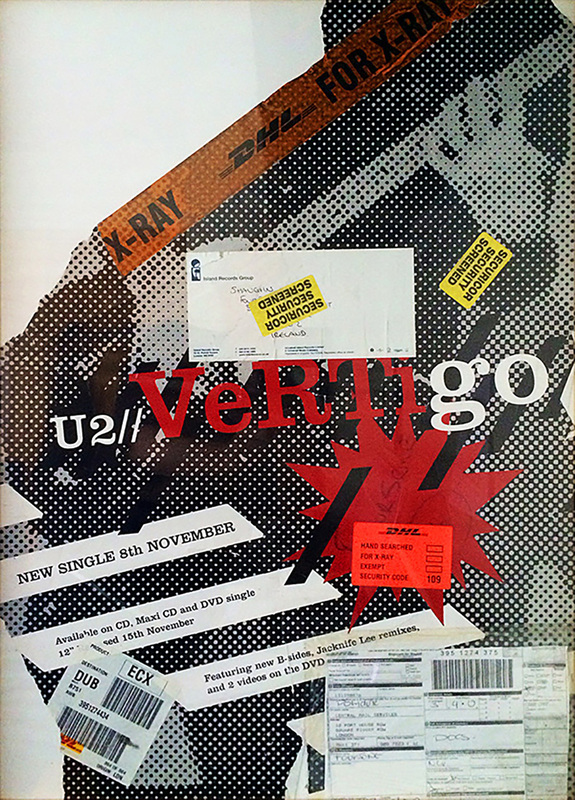 This is one of the oddities, it’s the remains of a U2 Vertigo single promotional poster used as package wrapping sent to us way back in 2004 that would have been posted to us by the record company. The proliferation of stickers and notices of air delivery officialdom haphazardly applied combined with the torn and missing poster parts gives this piece an authenticity that strangely mirrors the poster’s design. Much as we liked the actual designed poster, its the random deconstruction that occurred to the poster during its travels that makes this item more fascinating.